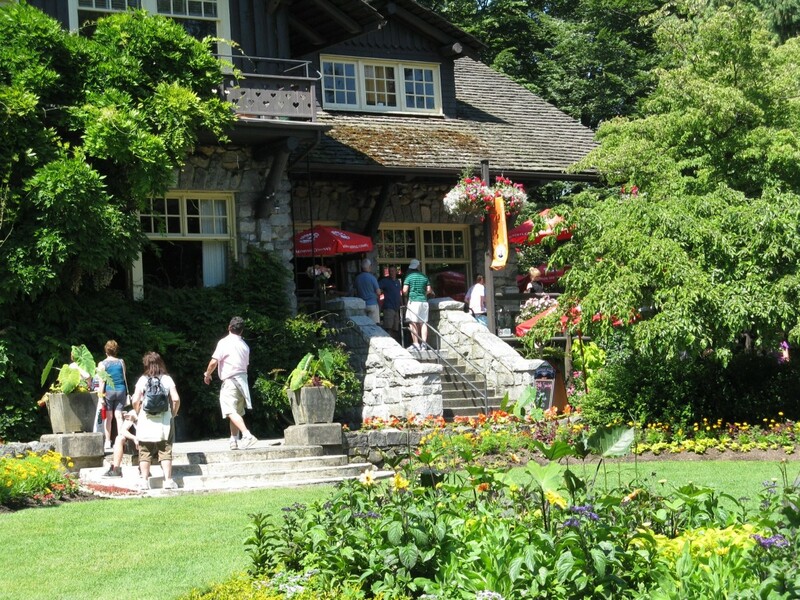 Visiting Stanley Park is a highlight of a trip to Vancouver, British Columbia. The park is a 988-acre oasis of coastal rainforest and green areas right next to the downtown area and the ocean. Much of the landscape consists of forest, but the park also contains large lawns, flower gardens, a lagoon, a lake, and beaches. One of my favourite areas is the beautiful rose garden, which I love to photograph. The park is located on a peninsula that extends into Burrard Inlet. A path travels along the seawall that surrounds the park. Walkers, runners, cyclists, inline skaters, and wheelchair users enjoy travelling on this very popular path. Trails allow people to explore the forest. 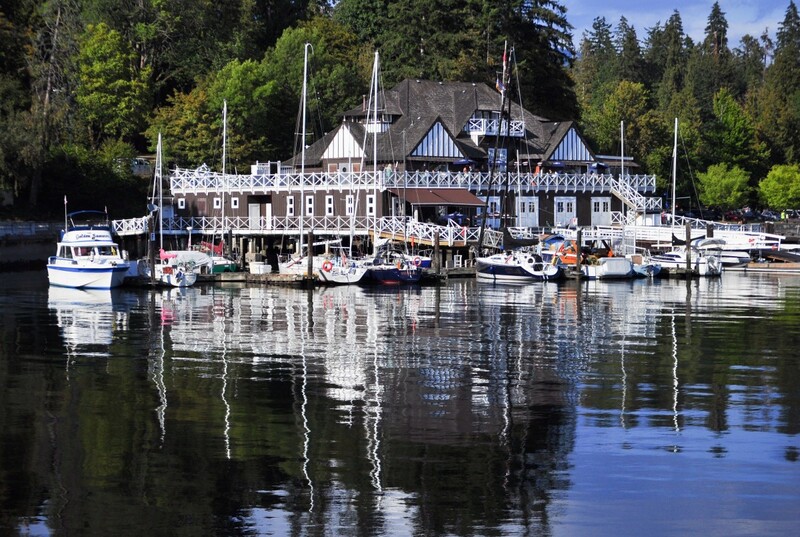 Stanley Park offers many different activities and contains many interesting tourist attractions. The area is a wonderful destination for local people as well as tourists. There is so much to see and do that it would take many articles to describe the area completely. 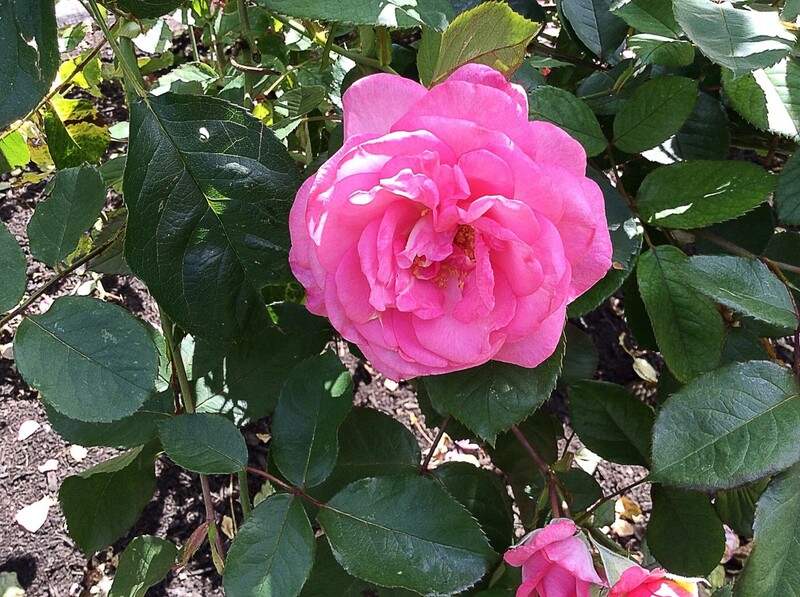 I've chosen to focus on the rose garden and its nearby surroundings. 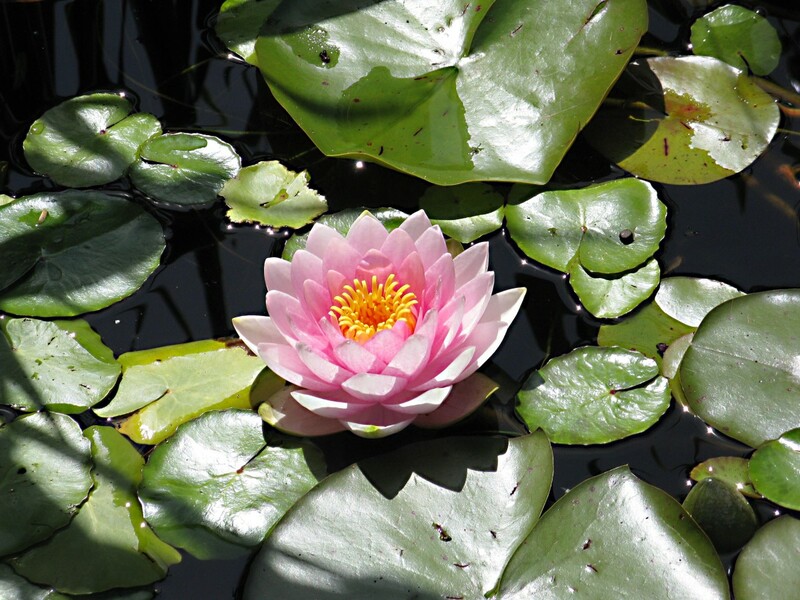 All of the photos in this article were taken by me during my visits to the garden. 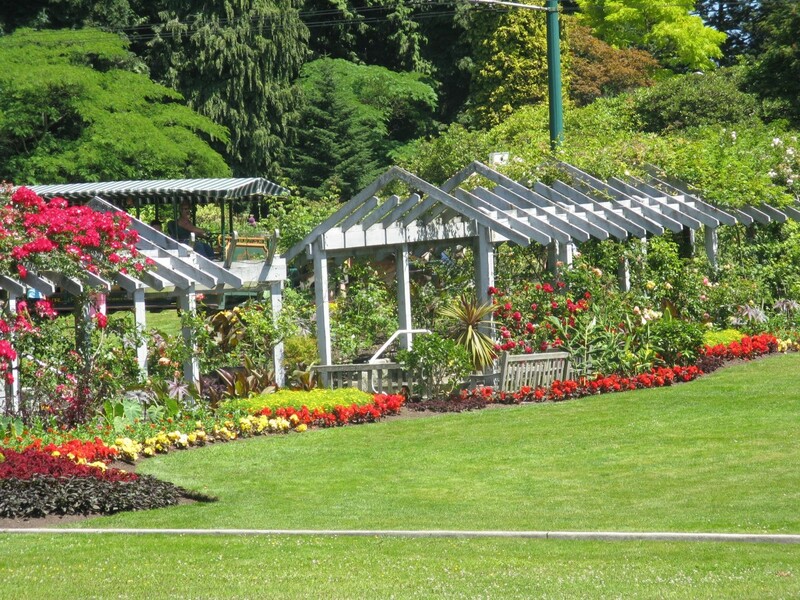 The Stanley Park rose garden was established in 1920 by the Kiwanis Club, a service organization. 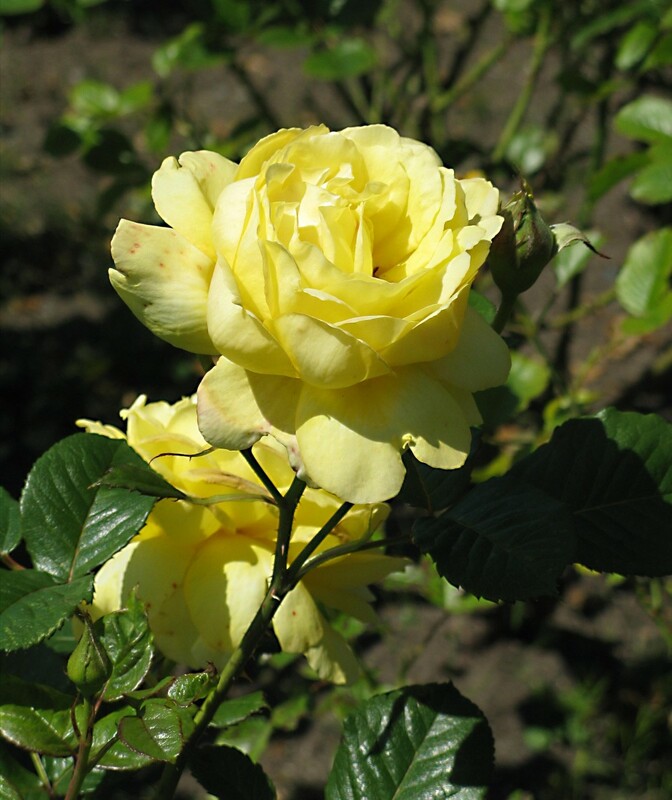 It contains over 3,500 rose bushes, which are arranged in flower beds and also climb over an arbor. 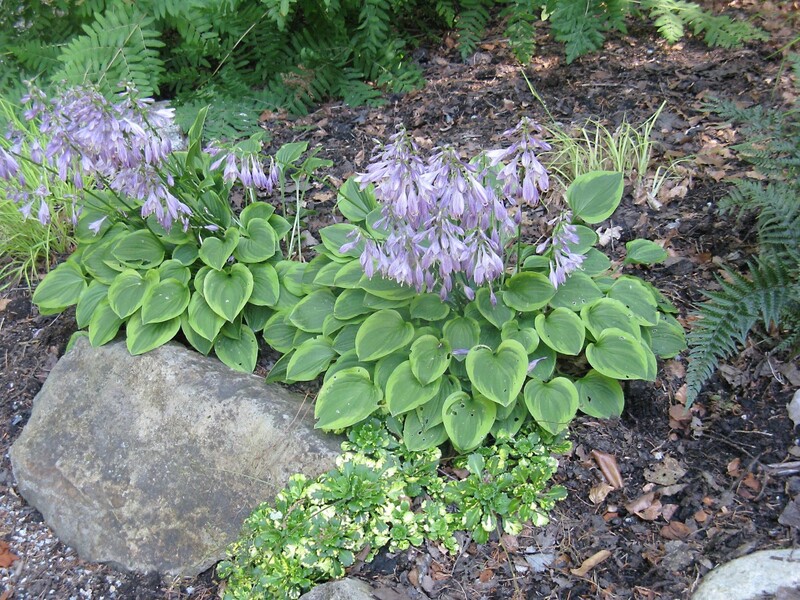 Other cultivated plants and flowers surround the garden. 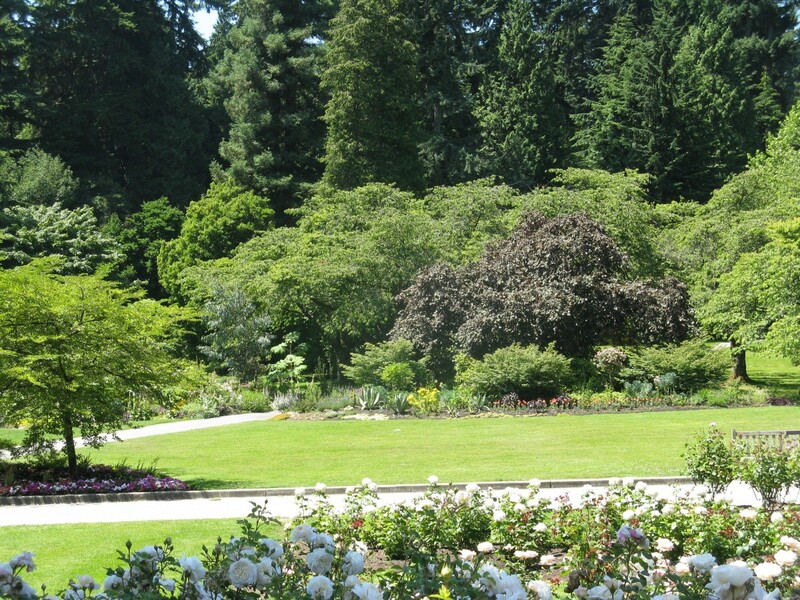 The rose garden is divided into two sections, which are located on either side of a road. One of the joys of entering the garden is the glorious splash of colour that appears. The other is the beautiful fragrance that is carried on the breeze. The flower beds are surrounded by a lawn. Visitors can walk on the grass so that they can get a close-up view of the roses and other flowers. 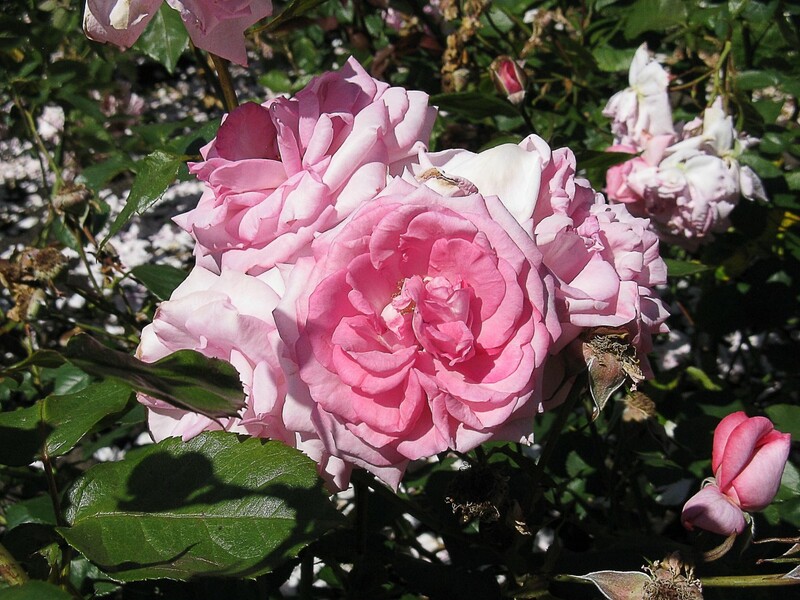 The roses bloom in summer, but there are also colourful flowers to see in the spring and fall. The garden is a popular place for summer wedding photographs. 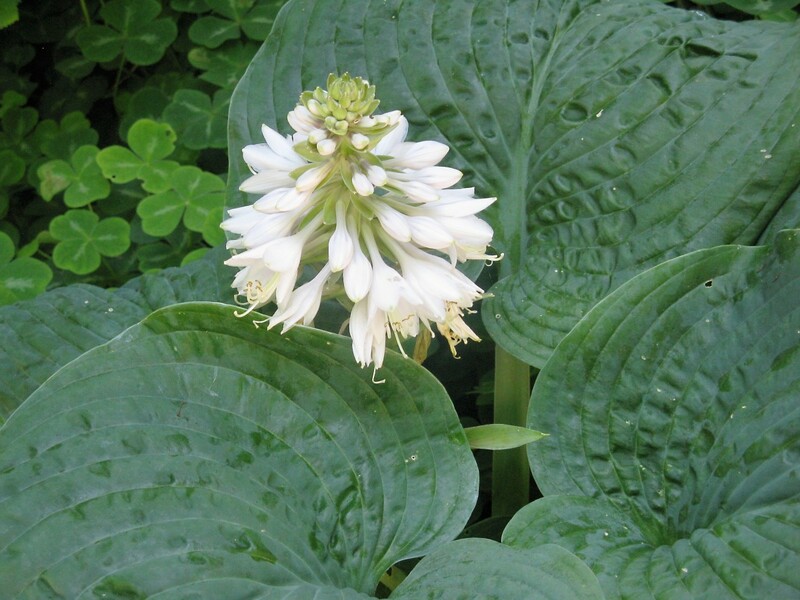 In fact, almost every time that I visit the garden in summer I see a bride in her beautiful white gown. In winter there isn't as much colour in the garden, but the lovely evergreen shrubs and trees make it a pleasant place to visit. 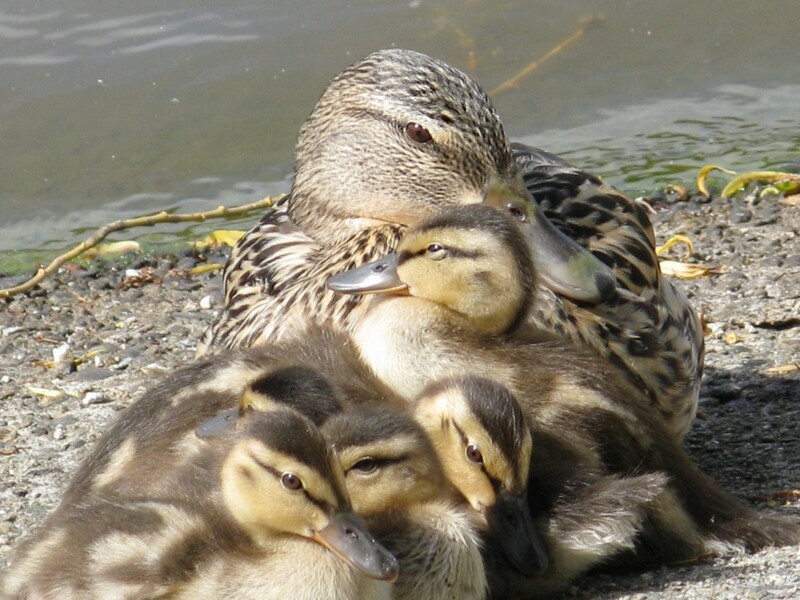 Winter has its own attractions in Stanley Park, including the presence of a wide variety of water birds. 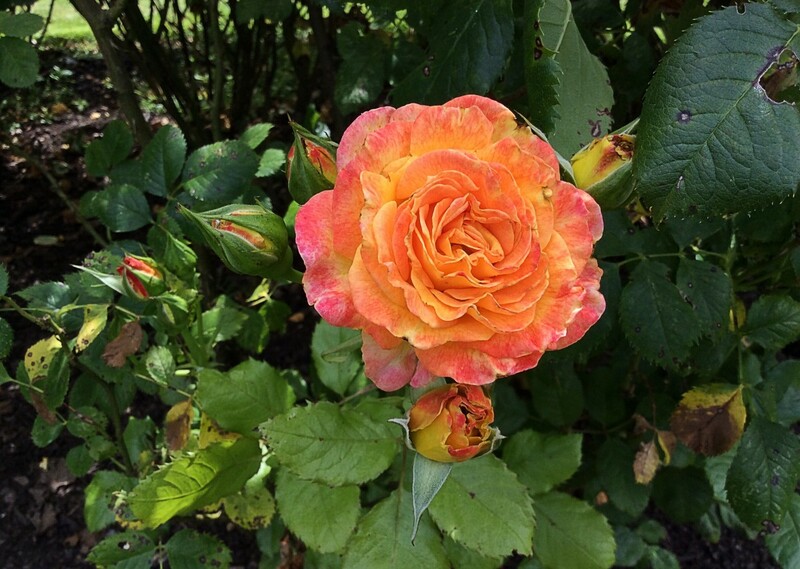 June to August is the best time to see the roses in bloom. By August, however, the flower display is generally past its prime. It's still worth seeing, though. I love the rich colour of these flowers. A causeway runs though Stanley Park. Traffic moves along this causeway to and from the Lions Gate Bridge, which travels over Burrard Inlet to the city of North Vancouver. On the left side of the causeway (as you enter the park from downtown Vancouver) is Lost Lagoon. Beyond this is the seawall path. On the right side of the causeway is the route to Lord Stanley's statue, and even further to the right is the seawall path. The seawall path makes a loop around the park, which is why it's found on both the left and the right of the causeway. To get to the rose garden, go to Lord Stanley's statue and follow the path on the left of the statue. You'll see the rose garden very soon. There are other ways to reach the rose garden, too. There are plenty of signposts in Stanley Park to show visitors where the different attractions are located. Gardeners, other park staff, and park visitors will almost certainly be able to help with directions as well. Maps of Stanley Park are posted around the park and are available at the information centre as well as at the Vancouver parks and recreation website. The path on the left of Lord Stanley's statue leads to the rose garden. Lord Stanley was the Governor General of Canada from 1888 to 1893. 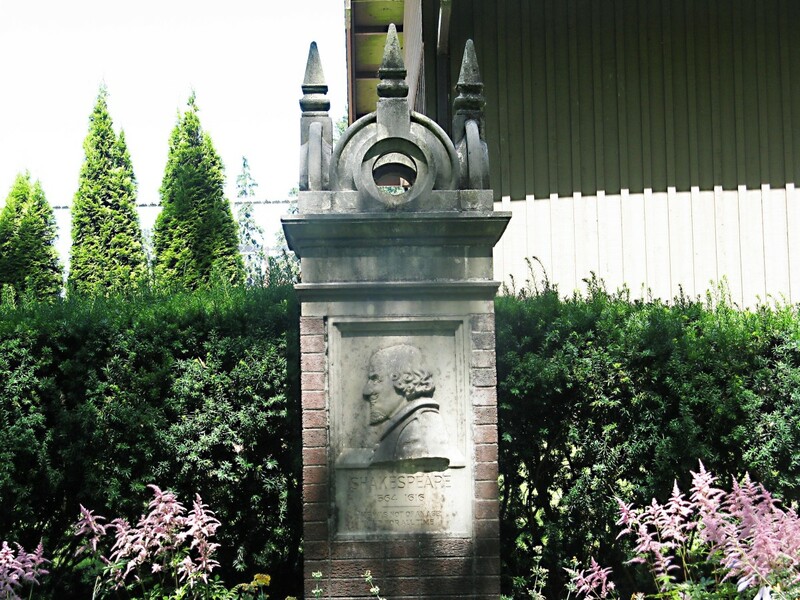 Stanley Park is named in his honour. 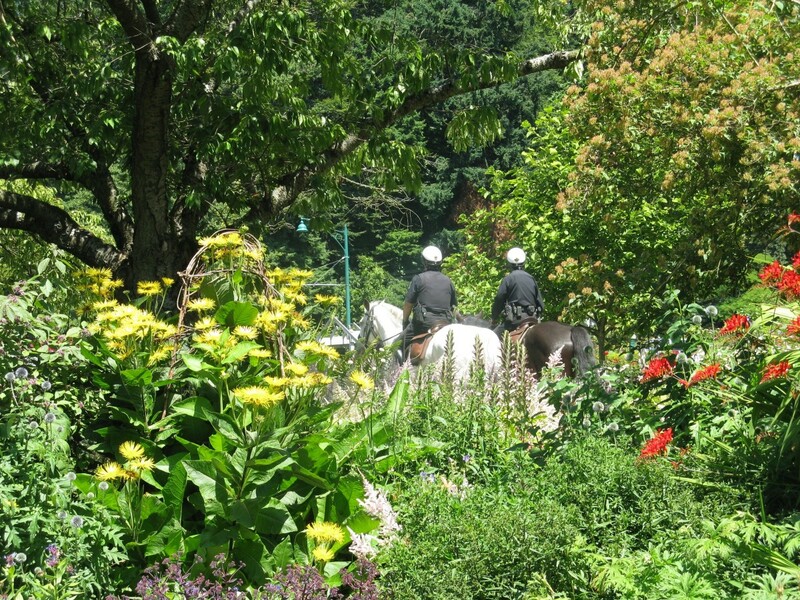 Mounted police patrol Stanley Park. 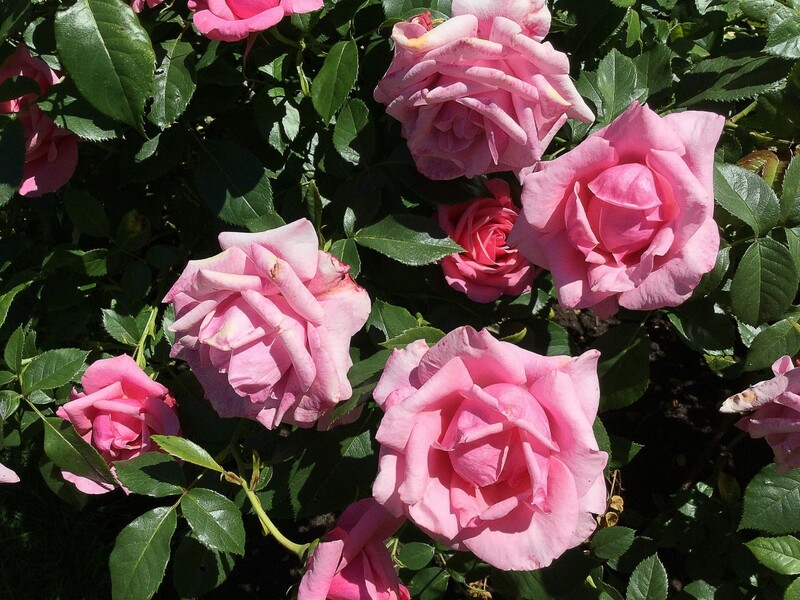 If you visit the rose garden in spring (March to May) you won't see roses in bloom, but you will see beautiful tulips, daffodils, and other bulb flowers. You will also see beautiful cherry blossom in late March and in April. The Shakespeare garden is located next to the rose garden. 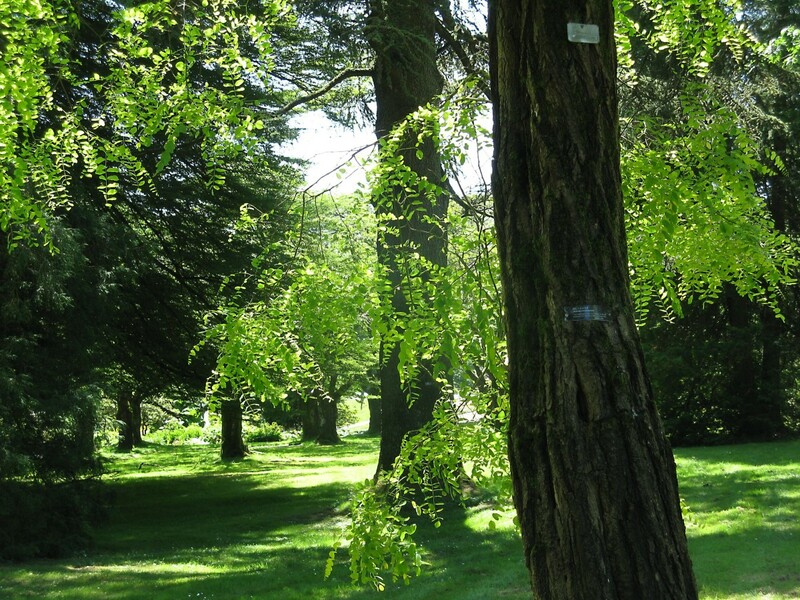 It's an arboretum containing trees mentioned in the writings of William Shakespeare. Each tree bears a plaque containing the relevant quote. 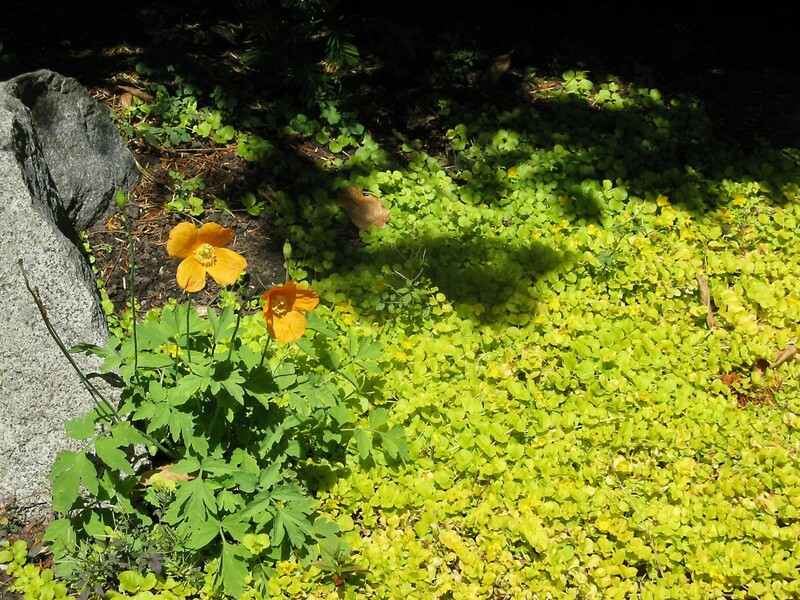 The garden is a nice, shady place on a hot day. It's interesting to explore the area and see trees that wouldn't normally live in the park. Hunting for the plaques can be fun, too. 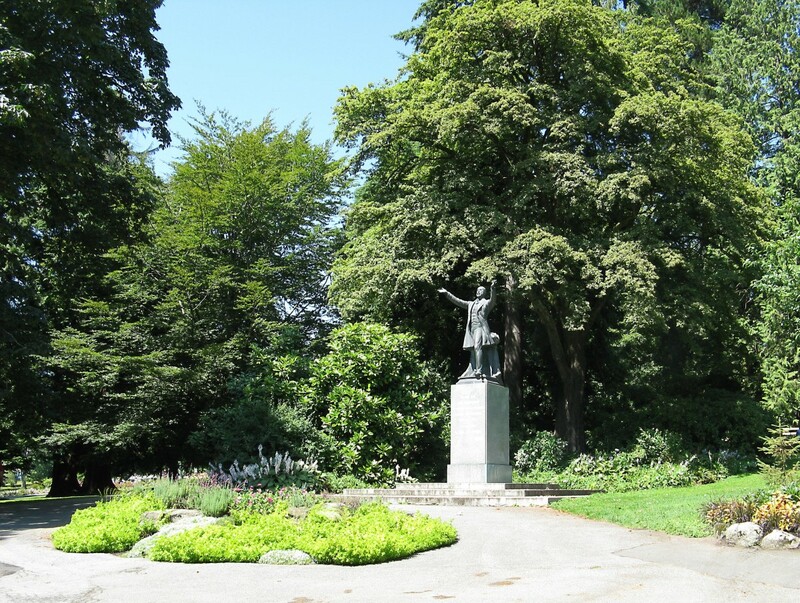 If you walk from the rose garden behind Lord Stanley's statue you'll find the Stanley Park Pavilion. The pavilion was established in 1911. 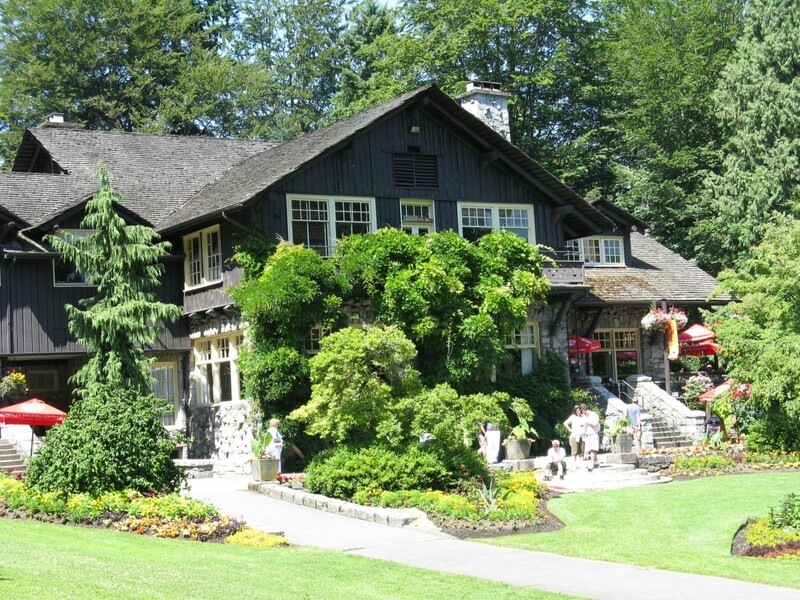 The building has a rustic appearance and houses a restaurant, a bar and grill, a gift shop, and banquet and wedding facilities. The landscaping in front of the pavilion is very pretty and attracts lots of photographers. The rock garden is located next to the landscaped area in front of the pavilion. It has an interesting history. It was created by John Montgomery, a master gardener, between 1911 and 1920. It seems to have been a labour of love. For some reason, part of the garden became untended, overgrown, and forgotten. In 2006 a very serious windstorm swept through Stanley Park, felling many trees. As sad as this event was, it did have one advantage. The felled trees exposed remnants of the former extent of the rock garden. The area has now been cleared and replanted. The garden in front of the pavilion is a popular place to take photographs. Many roads lead from downtown Vancouver to Stanley Park. The park is within walking distance from the downtown area, assuming a person is reasonably fit and mobile. In addition to the roads, there is a lovely pedestrian path that travels beside Burrard Inlet from downtown to the park. Bus service is available, too. The park contains pay parking areas for vehicles. To reach the park, head along any road that heads west from the downtown core. In Vancouver, it's easy to identify the direction in which you're moving. Just look for the mountains—they represent north. In fact, they're called the North Shore Mountains because they're on the north shore of Burrard Inlet. I take the SkyTrain (a rapid transit system) to the downtown area and then walk to the park from there. One of my favorite routes to Stanley Park is along Robson Street, which is one of the most popular roads in downtown Vancouver. I get off the SkyTrain at the Burrard Street station and then walk up the hill (which isn't very steep) to Robson Street. This takes about five minutes. Then I turn right on Robson Street and walk to the park, which takes about twenty minutes at a moderately brisk pace. Robson Street is a tree-lined road with many interesting little shops. It may be hard for a visitor to avoid exploring the shops on the way to the park. My downfall is the Whole Foods market. I find it very hard to resist going inside as I pass by. The route changes from a commercial area to a quieter, residential area near Stanley Park. The road ends at the tennis courts beside Lost Lagoon. I turn right and travel through the tunnel under the causeway. At the end of the tunnel is a marina. On the left there are several pathways. The one next to the water is the seawall route. On the left of this route is a path that takes me to Lord Stanley's statue. Just beyond the statue, on its left side as I face it, is the rose garden. Even a single flower can be beautiful. My other favourite route to Stanley Park is along the Canada Place to Stanley Park walking/cycling path. This route takes longer than the Robson Street one because it's not completely straight, but it's very picturesque and offers many beautiful photo opportunities, especially on a sunny day. The path travels beside Burrard Inlet, so I can watch human activity on the water as I travel. The water, the mountains, and Stanley Park in the distance are lovely surroundings. There are marinas, a float plane terminus, flower beds, a park, and restaurants along the way. The seaside path ends at the marina in Stanley Park. The path besides the inlet can be accessed in many places. The starting point for the route is Canada Place, however. This is a large and attractive area that contains a pier with a promenade for walkers. In summer, it's also the terminus for cruise ships travelling to Alaska. The nearest SkyTrain station to Canada Place is the Waterfront station. Canada Place is located near the Waterfront SkyTrain station.. If you visit Vancouver, a trip to Stanley Park is a very enjoyable option. Since there is so much to see at the park, it's probably best to visit only a few sections each day, unless you have only a single day available for exploration. If this is the case you'll have to choose the parts of the park that you'd most like to visit. 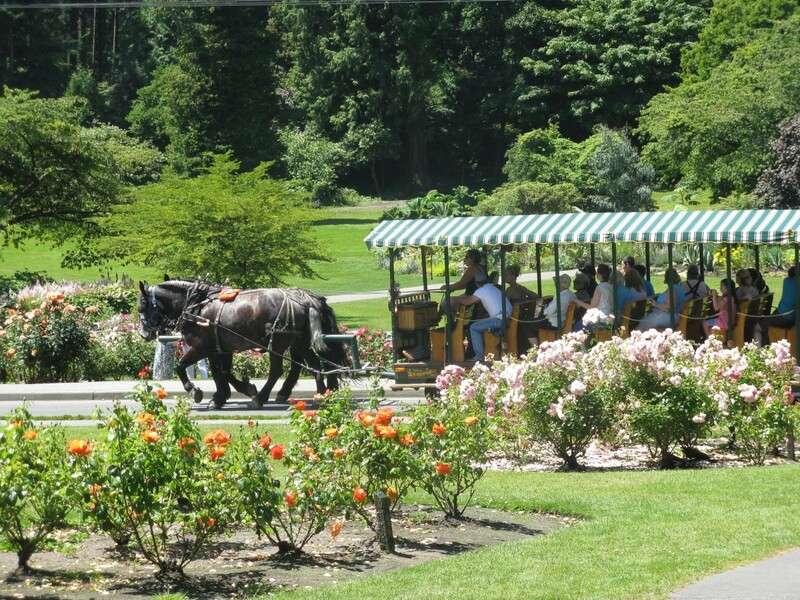 A bus trip to the park can be planned with the help of the TransLink website. The City of Vancouver website has downloadable maps of the park. It also has lots of information to help you make a decision about which parts of the park to explore. 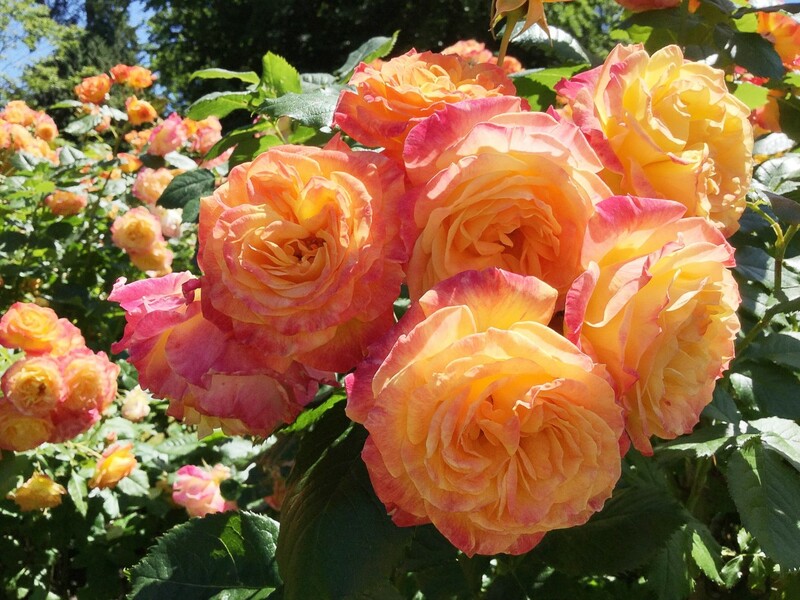 In summer you should definitely consider visiting the beautiful rose garden. The TransLink website has a trip planner to help people plan a route. Translink is the organization that runs the public transit system in the Vancouver area. 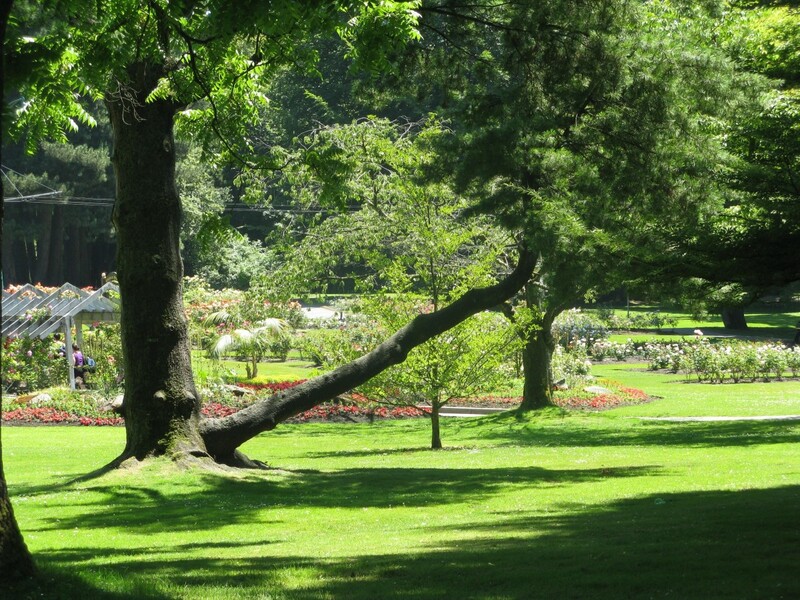 The parks and recreation section of the City of Vancouver website contains useful information about Stanley Park. 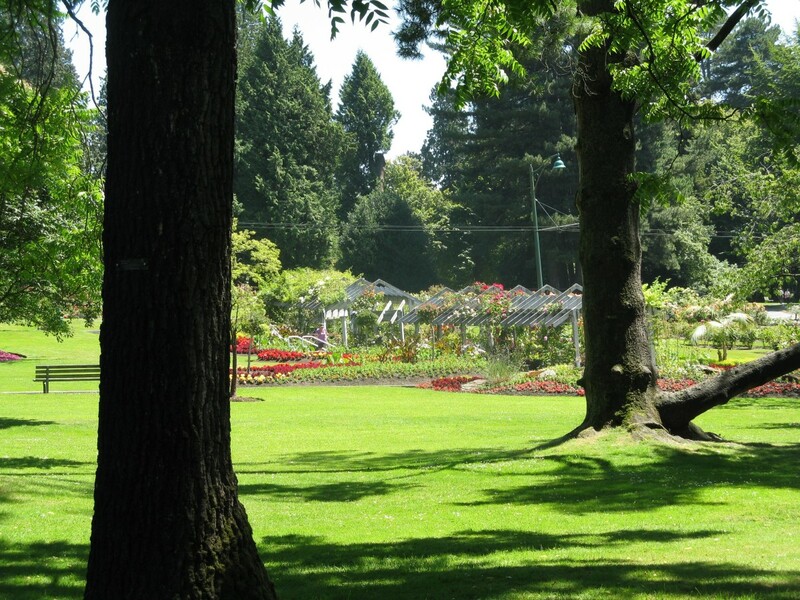 Can we do pre-wedding photography in the Stanley Park rose garden in Vancouver? I checked the City of Vancouver website and it said that no permit is needed to take wedding (or pre-wedding) photos in a city park. I think the only objection that anyone would make is if the photography creates a major obstruction for a long time. Other than that, I think taking wedding-related photos in the rose garden is a great idea. 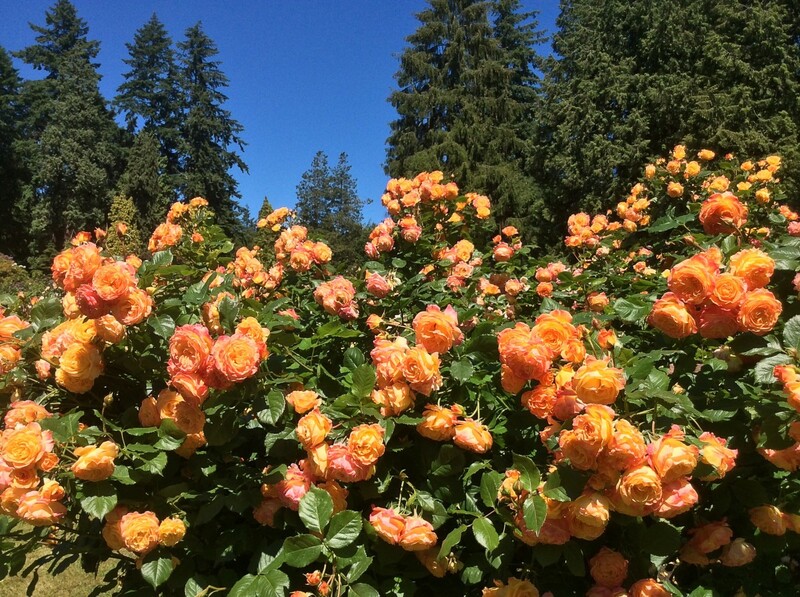 How far is the Stanley Park rose garden from Seattle, Washington? The distance between Seattle and Stanley Park is about 245 km or 152 miles. 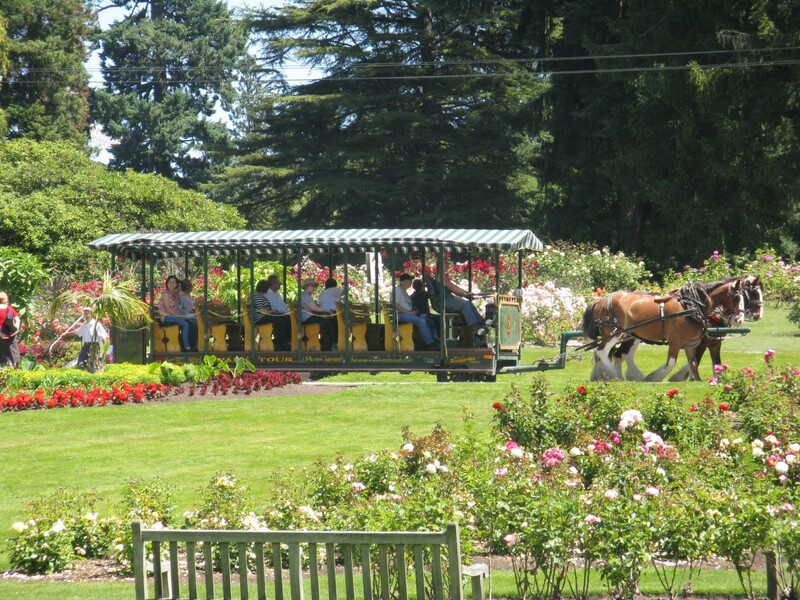 The rose garden is located not far from the main entrance to the park. Driving time from Seattle is said to be around two hours and fifty minutes. The time depends on how long it takes to cross the Canada-United States border, how much traffic is on the roads, and the exact starting point in Seattle. Birds, Flowers, and Attractions in Stanley Park, Vancouver B.C. Thank you for sharing your memories. I think that both places that you've mentioned are enjoyable to visit. Many years ago, when I was stationed in Tacoma, WA, I had the good fortune to make 2 visits to Vancouver. The first was with a group of soldier friends and among the places we visited was Granville Island. On my second trip there, with my girlfriend at the time, we visited Stanley Park. I'm afraid I don't remember much about the visit as we had only a short time there, but your Hub brought back some pleasant memories. Thank you. I appreciate your visit and your comment, Audrey. I've been to California once, but I'd love to go again and explore more of your state. 6 months ago from Idyllwild Ca. I love Vancouver! I took a long road trip from California to Vancouver and wanted to stay in this beautiful city. Your photos are so lovely. 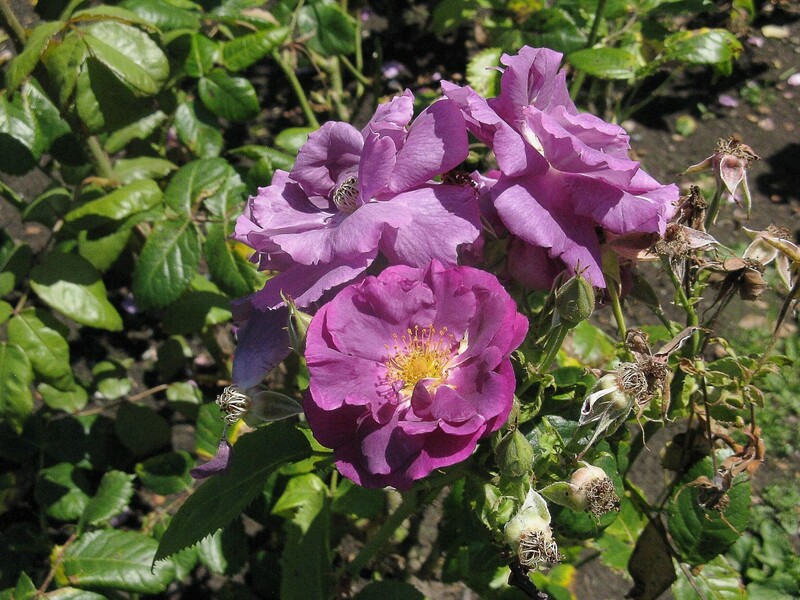 I want to go again and visit the Stanley Park Rose Garden. Thank you, for this beautiful article Linda. I appreciate your comment, Kenna. I love roses, too. A garden filled with them is a lovely sight. Roses are my favorite flowers because they are so beautiful but seem to have a mind of their own. I would love to visit Stanley Park. Your article is so thorough I feel like I was there. It's so lush and green. Hi, Barbara. The garden is certainly a lovely place to visit when the flowers are in bloom. Thanks for the comment about my photos. 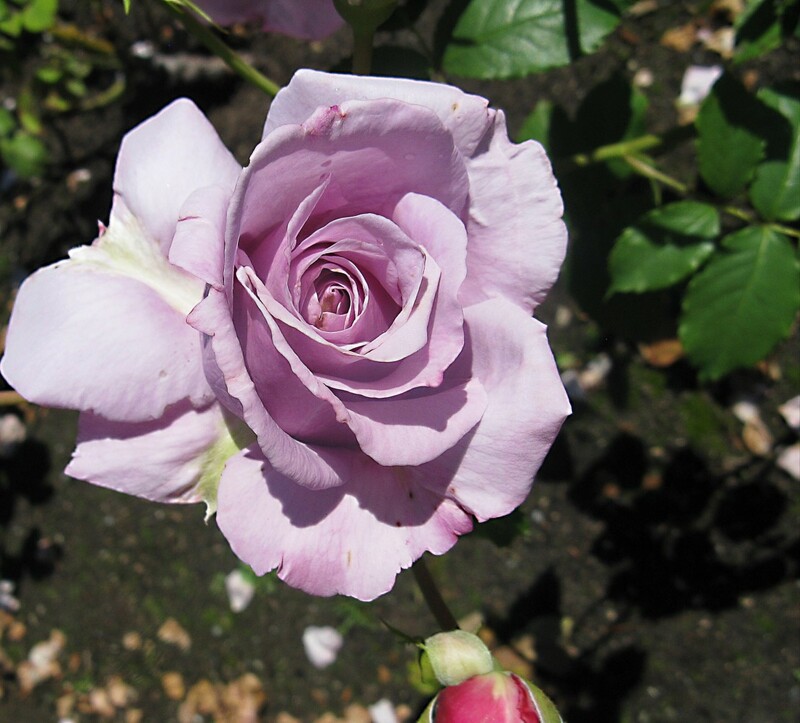 I think the lavender rose is beautiful, too. This sounds like a wonderful place to visit. The rose photos you are sharing are just beautiful. I like the lavender the best. 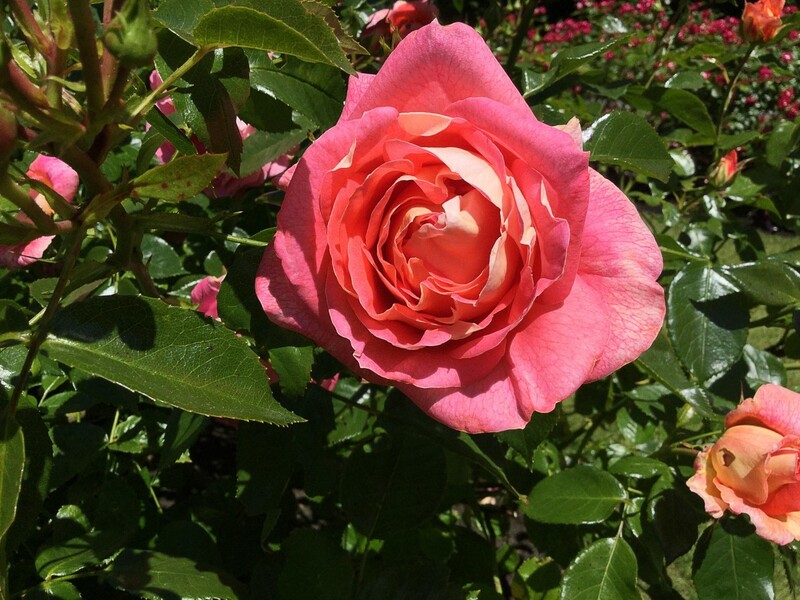 The rose garden is lovely when the flowers are in bloom. Photographing the flowers would be a great way to add to a stock of photos. That's a very beautiful garden. I love visiting gardens and take a lot of photos to enrich my photo stocks. Hi, Natalie. Thank you very much for the comment. I hope I meet you at the conference, too! It should be an informative event. Thought this was the perfect article to read before the Maven Conference! Hope to see you there! Thank you very much, Chitrangada. I'm looking forward to visiting the garden this year to see the roses. Wow! What a beautiful garden. Your pictures are so lovely. Many of the roses have such unique colour combination, which I haven’t seen earlier. And the garden itself looks wonderful. Thanks for providing the travel details. Altogether a pleasing experience to go through your well presented article. Thank you very much for the second visit, Thelma. I hope you get an opportunity to visit a large park or botanical garden soon. I love visiting this hub again. The photos are great. I have not visited a huge park like this for a while. Hi, Rolly. Thanks for the visit. The park and the garden are definitely worth visiting. As you say, there's always something interesting to see there! Thank you very much for the comment and the angels, Patricia. I hope your rose bushes flower soon. Roses are such beautiful flowers. They can be very meaningful, too. Hi Linda I am pretty sure I saw this before but I could not resist these beauties. They remind me of the beautiful rose bushes my Momma grew when I was a young girl in Virginia. I have two now but they have not flowered yet. Thank you very much for such a kind comment, pinto2011. I appreciate your visit. Very crisp and satiating display of your knowledge of this place. Am virtually able to see this place through your words. Hi, agusfanani. Yes, the area around the rose garden is beautiful. I always enjoy visiting this part of the park. Thank you for the comment. What a lovely rose garden. It sounds that not only is the garden beautiful but also other places around it. I think Shakespeare garden is very special one. I hope you enjoyed your visit to Vancouver, Joan. Thanks for the comment. Thank you very much for the comment, Elsie. I was happy to read your hub. I love roses, but I still have a lot to learn about them! 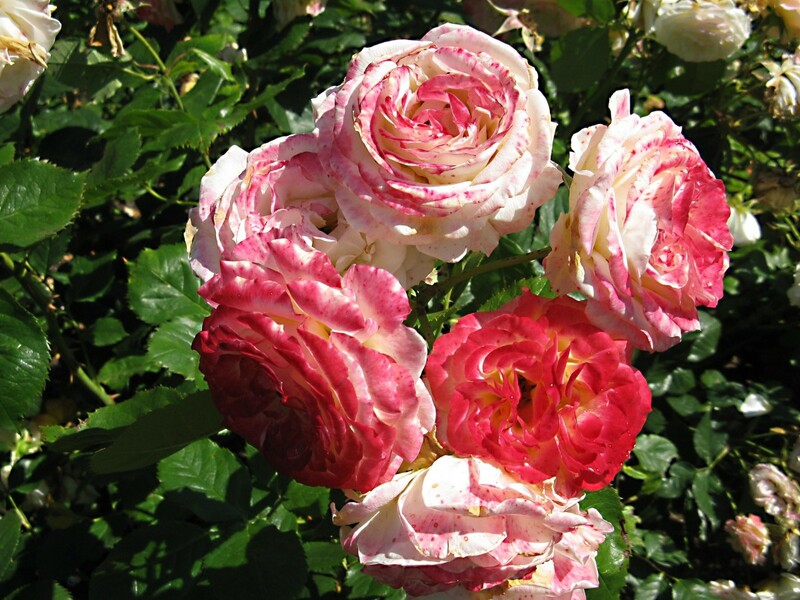 After viewing this article about roses I'm sure that you know everything about them, I do appreciate your visit and comment on my hub about roses. 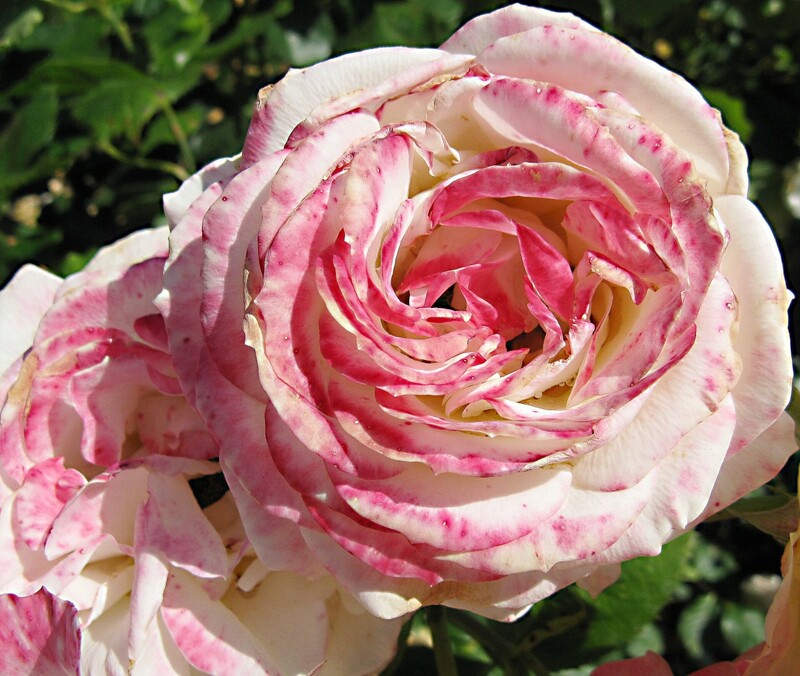 You have some beautiful roses here, loved the lavender one, thanks for sharing. Thank you very much for the visit and comment, sujaya venkatesh. Thank you, louise-barraco. I hope you do make it to the rose garden one day! It looks lovely, If I am ever out that way, I will look it up. Thank you very much, amazmerizing! I love visiting botanical gardens, too. Super nice article here! We love botanical gardens and go every chance we get! Love your roses too! Kudos!!! Thank you very much, Au fait! Stanley Park is a wonderful place to visit. I love the rose garden. Wow! A third HOTD! Gorgeous photos. You make this place look and sound like a wonderful place to visit. Hi, Scribenet. Thanks for the comment. Yes, roses do grow well in the climate here! They are always beautiful at Stanley Park. I have never visited the West coast but my Mother and Aunts did and Stanley Park was on their itinerary. 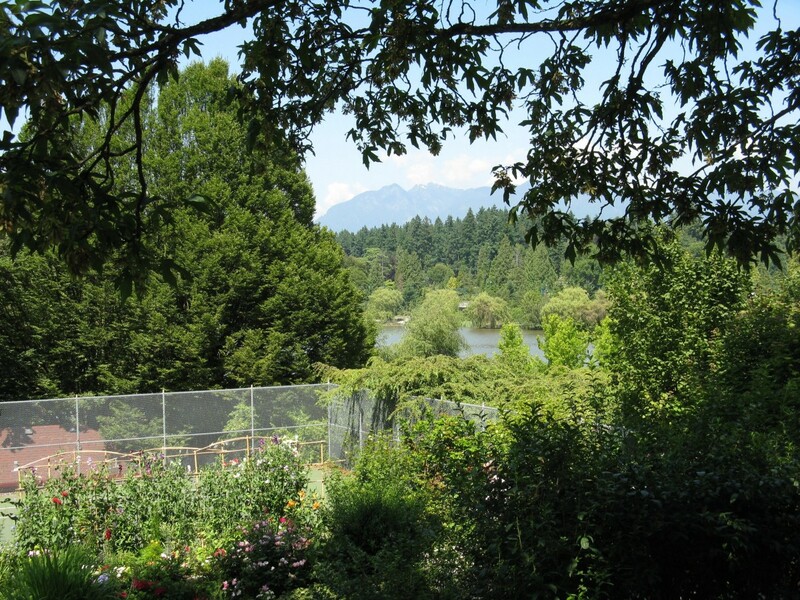 My aunt who was a great gardener always raved about Stanley Park. Great photographs. 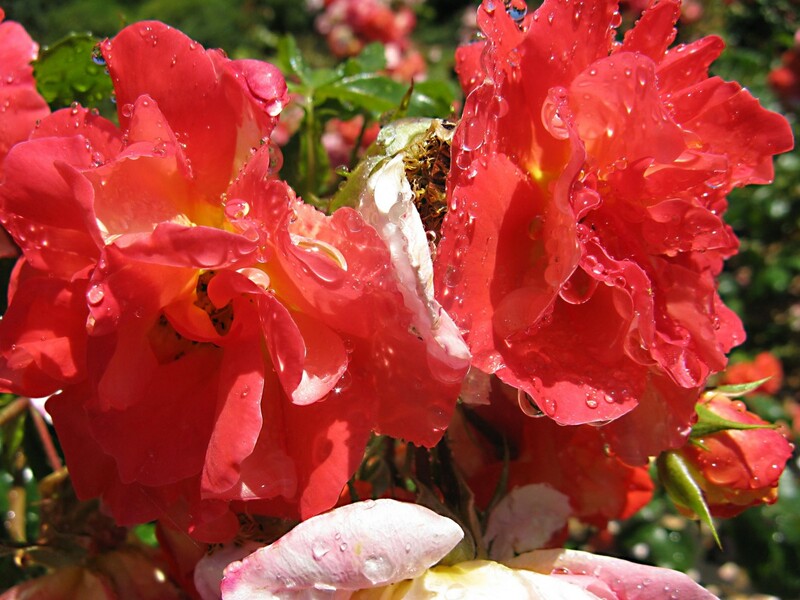 A rose garden in that climate has to be spectacular! Thank you very much for such a lovely comment, Pollyanna! I hope you find that rose, Patricia. What a wonderful tribute to your sister! Thank you very much for the comment, the votes and the share. I appreciate the pin very much, too. I thought I had commented here but do not see it so here goes. The pink and yellow rose is like the one my Momma planted in honor of my sister when she died at age 9 (I was 4). It was gorgeous and I have admired that rose through the years. the other day when I went to the produce stand I just wrote about they had one like it for sale. But I only had enough cash to pay for the food I was purchasing. I went back yesterday to get it and it was gone. 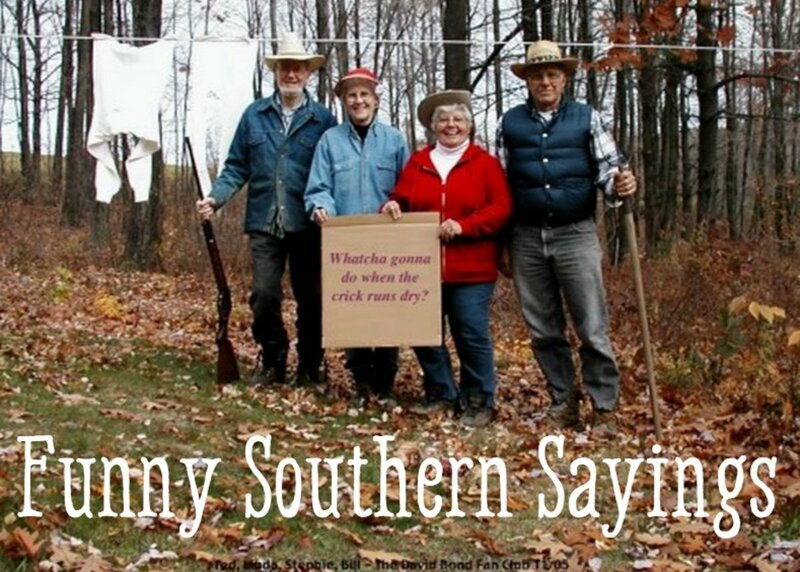 But, they are hoping to get more like it soon. Thank you for sharing your visit ....I totally adore visiting nature's wonderland and taking the many opportunities for great photos. Thanks for the lovely comment, Jackie! I appreciate it very much. So beautiful and there is nothing like a day photographing such beauty! I will have to learn to do those thumbnails on here! Fantastic hub. 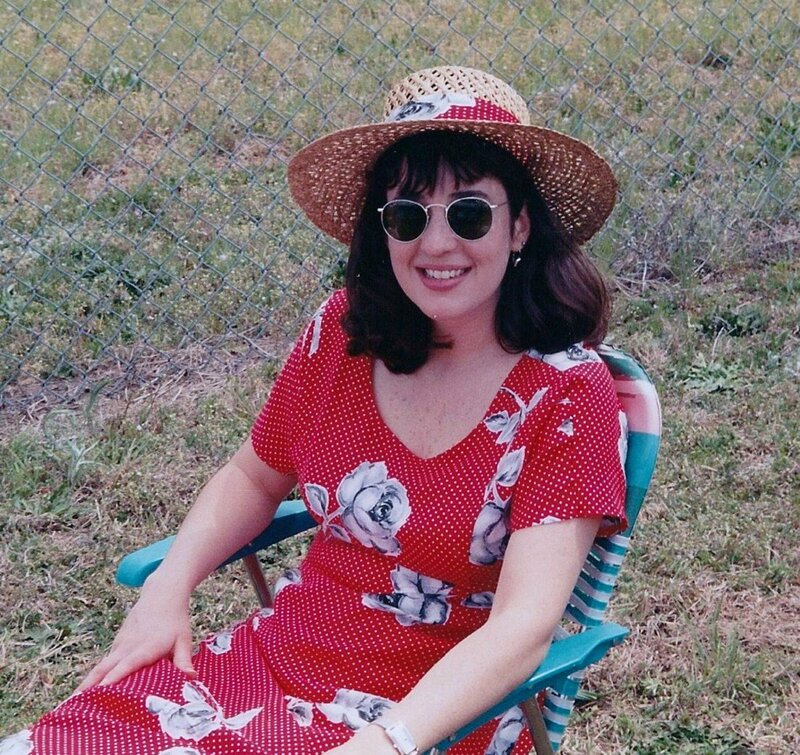 Thanks for the visit and the comment, ofelia. It's great to meet another person who loves visiting Stanley Park! I love this park! Beautiful place to visit, great hub Alicia! Hi, Kristen. Thanks for the comment and the vote! I went to Stanley Park yesterday. It's too early for the roses, but there are plenty of other flowers and trees in bloom. The park is a lovely place to visit. Alicia, what a lovely trip to the park. 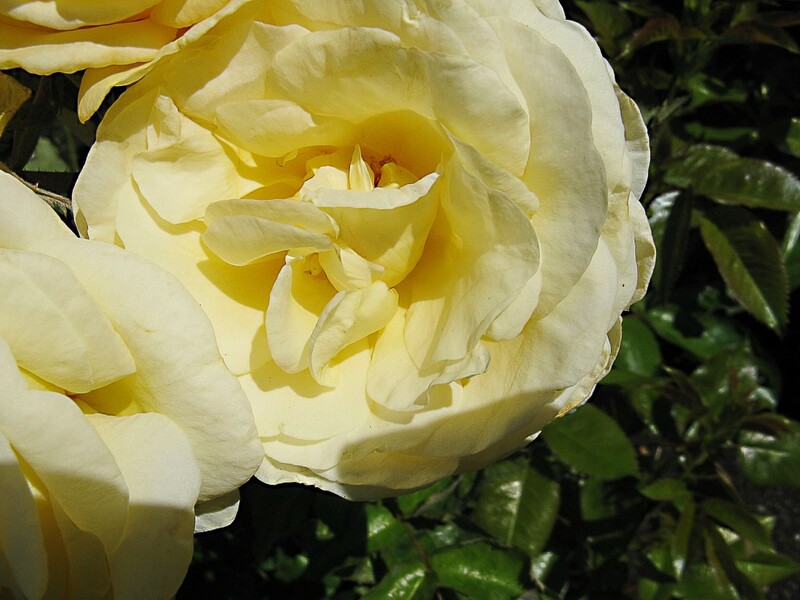 I love the photos of the variety of roses and the description of the park itself. I would love to take a trip there someday. 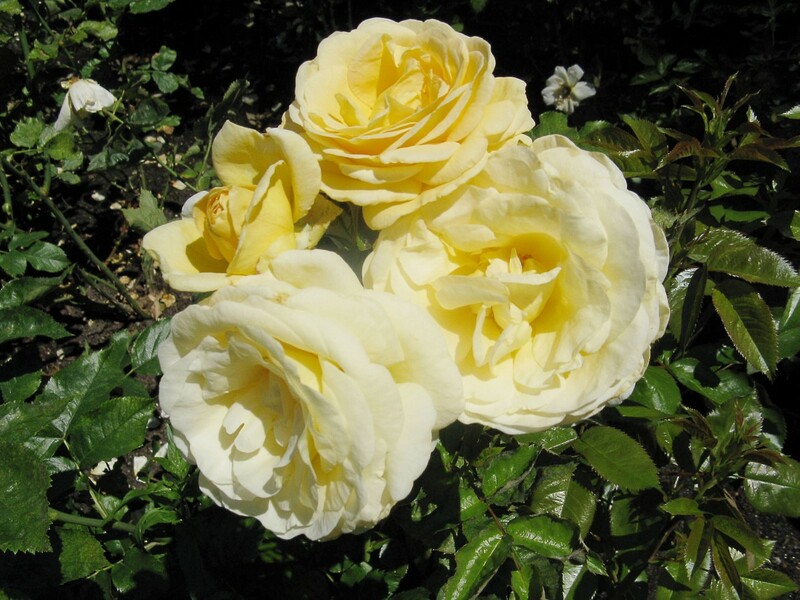 Voted up for beautiful roses! Thank you very much for the congratulations, colorfulone! I think that parks are the best part about cities, too. I hope you're able to see the rose garden in person one day. Alicia, I have not been there, but if I ever make it to Vancouver, that is where I would like to spend some time. I'm not much for cities, but beautiful parks like this are worth going to see. Thank you for the virtual tour, and congratulations on the well deserved Hub of the Day. Hi, Adventuretravels. Thanks for the comment. I've seen some of London's gardens. They certainly are beautiful! I love gardens too, and I am so lucky because London has many very famous parks and gardens. My favorite is Kew Gardens. if I'm ever in your neck of the woods I shall certainly remember to visit the Stanley Park Rose Garden - what a very interesting hubs. Thank you so much, Easy Exercise! I appreciate your very kind comment a great deal. I absolutely love gardens. Delightful! I started with roses in my own garden two years ago and I am now officially addicted. Oh, I love this hub! OUTSTANDING! Thank you! Hi, mollypocket. Thanks for the visit and the comment. The rose garden is certainly beautiful. I hope you're able to see it in person some time! Beautiful! Now I want to visit BC not only in the winter! Thank you for the comment, poetryman6969. I agree - a beautiful garden is a lovely place to visit! Few things are as lovely as a nice garden. Thanks for the hub. Thank you, javr. It's nice to meet someone else from British Columbia! Very nice roses. They are fantastic flowers. Such a delight to read, and the pictures are stunning! Thank you very much, favored. I appreciate your visit and comment. Beautiful. I can see why this was selected to receive such an honor. Hi, LadyFiddler. Thank you for the visit and the comment! Hi Alicia this was very beautiful and deserved the Hub award it got. Nice sceneries i love nature so i won't mind visiting such a place. Thank you very much, stricktlydating! I appreciate your kind comment. I love visiting botanical gardens, too. They are so lovely to photograph! I love going to these type of gardens. Have not been there though. Thank you so much for the lovely comment, stuff4kids! I appreciate your visit. Yes, the end of summer is in sight, which is sad. Fall has its nice points, though! Best wishes to you. Wow! What a beautiful place and what a beautiful hub! It really is delightful to see this - and such gorgeous pictures. Just as here we are beginning to feel the first chilly pinch of Fall, it's great to feast on such summer loveliness. Thank you very much for the congratulations, comment and share, techygran! You must have lovely memories of Stanley Park. I hope you get to see it again soon. Congratulations on a well-deserved Hub-of-the-Day award! I am so nostalgic after reading this. I live on beautiful Vancouver Island, but I have a very soft place in my heart for Stanley Park, the place where my husband of 44 years and I did much of our youthful courting. I'll have to make the trip over the Pond soon! Thank you for the wonderful article and photos, and I am sharing this for sure! Hi, stbrians. 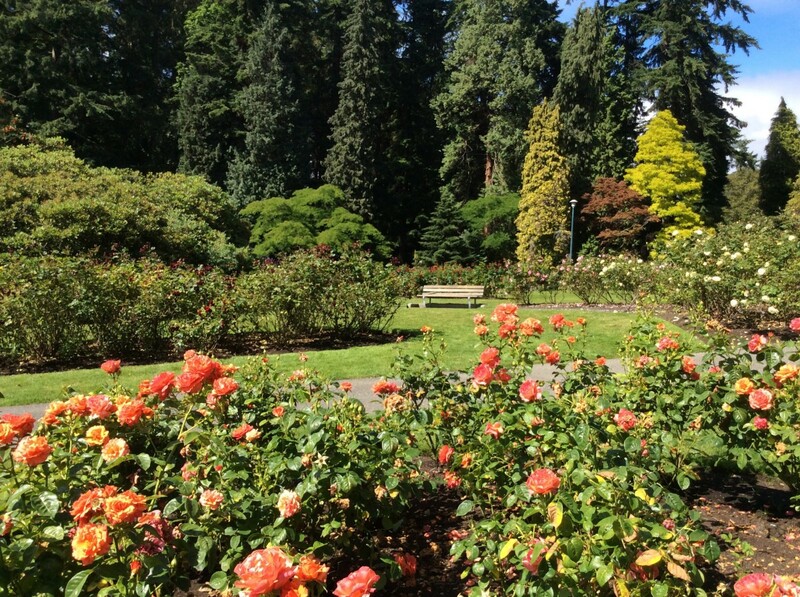 Yes, the rose garden at Stanley Park is beautiful. The park is certainly worth a visit! Thank you for the comment. Thank you, SEO in Vancouver! I appreciate your visit. Lovely photos! Thank you for posting! Thank you very much, KoffeeKlatch Gals! Yes, the rose garden is a beautiful place to visit. I'm looking forward to seeing the roses again soon. I hope you're able to see them some day, too! I've never been there, I hope to someday. It looks like am beautiful place to visit. I absolutely love your photos. Thank you very much for the comment, the vote and the pin, Writer Fox! I appreciate your visit. Lovely Roses! I really enjoyed these and I pinned one of the pictures to my Pinterest board for roses. Voted up! Thank you very much, Easy Exercise! Butchart Gardens is a wonderful place. The flowers are gorgeous there. Stanley Park is very nice, too. It's much nearer my home so I visit it more often. Outstanding! What a wonderful experience. 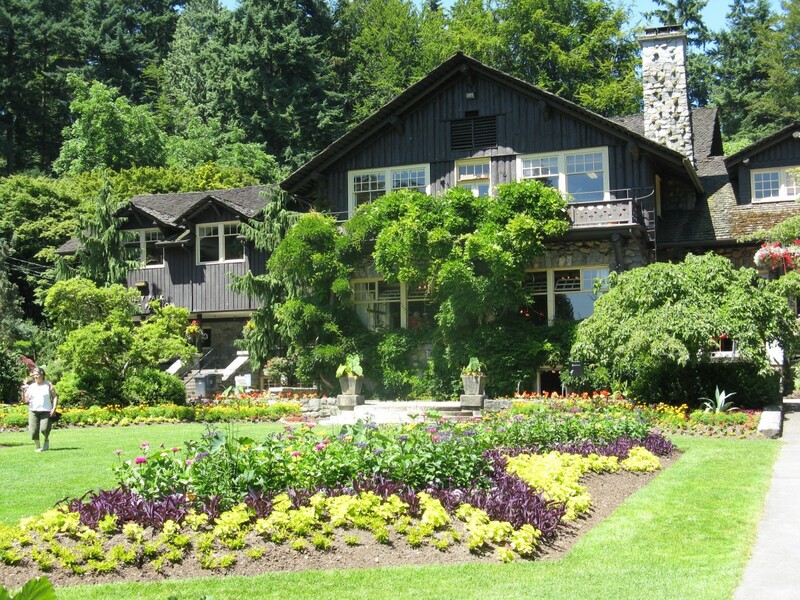 I have visited Butchart Gardens but was not aware of this gem in Canada. We visited Buchart by accident, Stanley Park will be a conscious decision thanks to your hub. Thank you! Thank you! It's nice to meet you, kerlund74. Such a fantastic collection of roses, love it! Hi, Peggy. I've wanted to stay at the Weston Bayshore Hotel for a long time. That would be such an interesting experience, especially since the hotel is right beside Stanley Park! As you say, the park is beautiful. Thank you very much for the visit, Peggy. Stanley Park in Vancouver is beautiful! We walked over to it several days and enjoyed it when we were staying at the Weston Bayshore Hotel many years ago. Thank you very much, Kathi! I appreciate your kind comment. I hope you are able to visit Stanley Park in person one day. My kind of place . . . would love to visit there one day! I can almost smell the roses in your beautiful photographs! Lovely presentation Alicia! Thank you very much for the kind comment, DDE. I appreciate your visit. The Beautiful Stanley Park Rose Garden in Vancouver BC gorgeous photos and well done on this achievement, A beautifully presented hub and most informed indeed. Thank you very much for the comment and the votes, oliversmum. Vancouver does have some beautiful scenery. It's a lovely city to visit, especially for photographers! Thank you for the comment, crookedcreekphoto! If I was visiting a new place and felt lonely, I would take comfort in nature, too. Stanley Park is a lovely place to do that. I'm glad that you enjoyed your visits. Stanley Park is a beautiful place. I had to travel for business to BC several years ago. I missed my family something awful but one of the things that helped me get through it was visiting this beautiful park after my training. These photographs are beautiful. Butchart Gardens is a beautiful place! I've been there several times, but not recently. It's a wonderful place to take photographs. Thanks for the visit, Schoolmom24. I enjoyed this article and it reminded me of my visit to Butchart Gardens in Canada with my church youth group back in the late 70's. 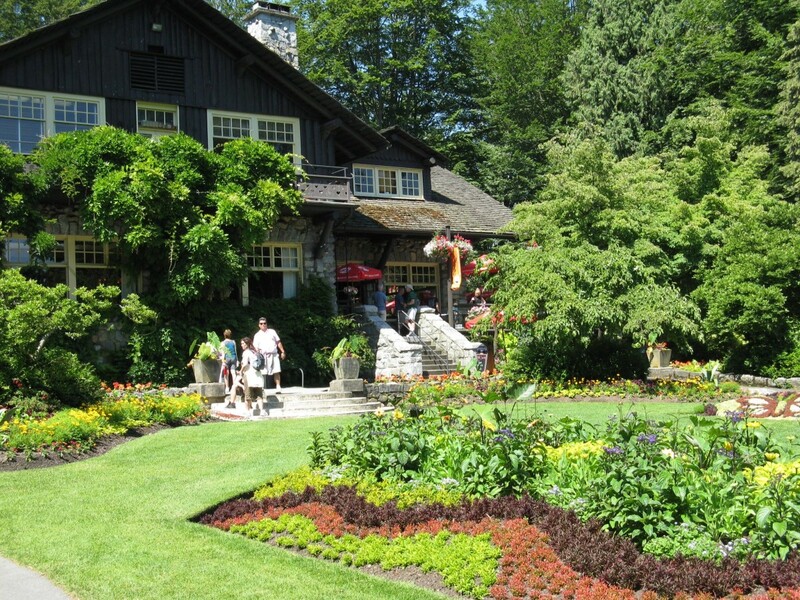 I would love to go back to Canada and to check out Stanley Garden as well. Thank you very much for the comment, Glimmer! I appreciate your congratulations and the pin, too. I hope you had a great vacation. Just returning from a vacation and an extended summer slump. Catching up on my reading and this is just beautiful. 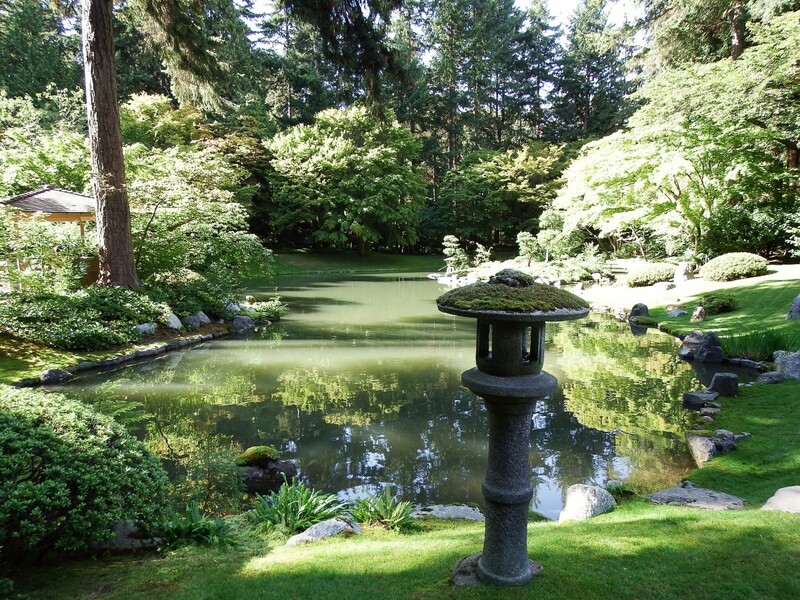 Vancouver is on my must see list and this garden was one of the reasons. Thanks for this indepth tour. Now this area has been bumped up a bit. Congrats on your HOTD too. Well deserved. Beautiful hub and pinned.